April 22, 2019 (HP137). Until last week, the evidence for black holes had been obtained indirectly, for example by measuring the black hole’s gravitational effect on the path of other celestial bodies and more recently by detection of gravity waves from the collision of black holes using the Laser Interferometer Gravitational-Wave Observatory (LIGO) in 2015 (Nobel Laureate Dr. Weiss presented a seminar on that discovery at the recent Applied Superconductivity Conference in 2018). However, very excitingly for our superconducting community, a black hole has now been imaged using superconducting detectors at radio astronomy observatories around the world in a remarkable and common-culture captivating discovery. This mapping of the gas ring swirling around and violently captured by the black hole also provided further confirmation of Einstein’s theories on relativity and enabled astronomers to measure its mass (6.5 billion times heavier than our own sun!). This feat is remarkable on many levels. The black hole was chosen for imaging because it had the clearest sight-lines from earth, yet it is 55 million light years, or three hundred quintillion miles away. The imaged gas emission ring surrounding the black hole’s event horizon is only on order of the size of a single star. And as if the task couldn’t get more challenging, the electromagnetic signal that transverses the heavens is attenuated and distorted by gas clouds and ionized particles along its 55-million-year journey. While it took an international cast of scientists and engineers working together to accomplish this feat, this discovery could not have been accomplished without the heart of the telescope- the Superconducting Insulating Superconducting (SIS) detectors that first greeted each photon after its long journey through the heavens. Fig.1. 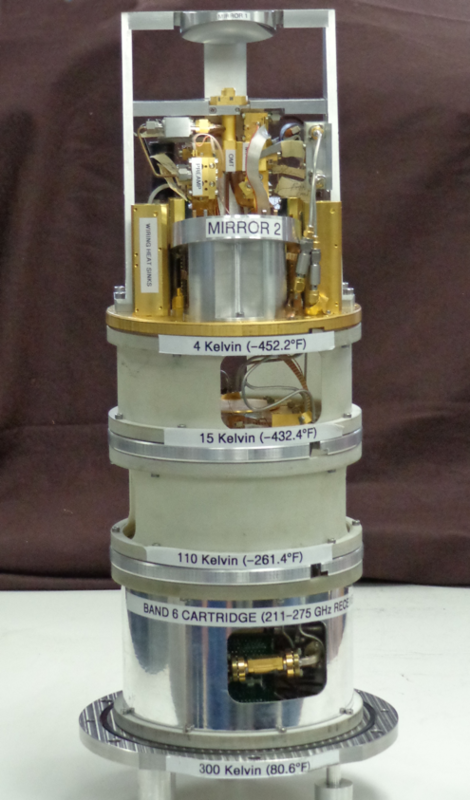 ( Picture of an NRAO-UVA Band6 ALMA receiver . March 28, 2019 (STH61, HP136). Since 2008, iron-based superconductors (IBS) have attracted wide interest for both basic research and practical applications. For the practical application, 100 m class Sr1-xKxFe2As2 (Sr122) tapes have been fabricated in 2017 . An average Jc of 1.3 × 104 A/cm2 at 4.2 K and 10 T was reached over a 115-m length, showing good longitudinal uniformity. Recently, we firstly fabricated a 30 mm diameter iron-based superconductor single pancake coil (SPC) and successfully tested its transport properties in a 24 T background field. This SPC was successfully made by using the 7-filamentary Ba1-xKxFe2As2 (Ba122) tape produced by a wind-and-react method. This IBS coil shows the highest in-field Ic values reported so far. Even more encouraging is the fact that the Ic of this SPC is still as high as 26 A under 24 T background field, which is still about 40% of that at zero external magnetic field. The high performance of the 30 mm iron-based superconducting coil under 24 T background field clearly demonstrates that the iron-based superconductors are very promising for high-field magnet applications. Fig.1. (a) Ba122 single pancake coil (SPC). (b) Magnetic field dependence of transport critical current at 4.2 K for the Ba122 straight tape and SPC. Prior to submitting any material for online publication, please consult the current Guidelines for Authors. (A434). The Association for Women in Science is holding its annual summit on Wednesday, April 24, 2019, in Washington, D.C.
CEC/ICMC'19 Conference Registration Now Open! (A433). CEC/ICMC'19 Conference Registration Now Open! Early Registration Deadline: June 5, 2019. April 1, 2019 (A425U). The biannual 10th German Seminar on Superconductivity for power grid will be held on June 25 and 26, 2019, and is traditionally called the "Braunschweiger Supraleiterseminar". Congratulations to the IEEE CSC Fellows Class of 2019! (PA43) ...elevated by the IEEE Board of Directors to the prestigious grade of IEEE Fellow (Class 2019).